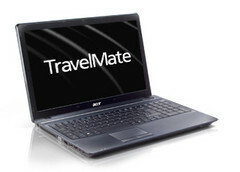 The Taiwan-based PC manufacturer, Acer, recently announced in a press release that it has readied two new TravelMate notebooks for sale. Reportedly, these laptops are aimed at mobile business professionals, whose activities are increasingly reliant on multimedia and graphics. The new TravelMate 7750 and 4750 series will be powered by a choice of second generation Sandy Bridge Intel Core central processing units. Furthermore, these laptops will house an Intel HM65 Express Chipset, which simultaneously boosts productivity and saves energy. Acer’s upcoming 17.3-inch (7750) and 14.0-inch (4750) laptops can be equipped with up to 8GB of internal memory. In addition, the devices will feature one or two spacious mechanical hard drives with a storage capacity of up to 750GB (1.5TB total) and will ship with either an integrated or a discrete graphics controller. In terms of connectivity, the two TravelMates have built-in Wi-Fi and Bluetooth 3.0 adapters, USB 3.0 output as well as Intel’s Wireless Display technology for viewing HD content on remote HD displays or TVs. The integrated web camera (with Acer Video Conference Manager software) can be used for video conferencing. Obviously, security is quite important when it comes to business products. Both the 7750 and 4750 reportedly feature BIOS/HDD password protection, built-in Anti-Theft technology (lets you remotely lock your laptop in case it gets stolen) and Absolute Data Protection (ADP). According to the press release, Acer’s new notebooks will offer long battery life and a “pleasant yet practical design”.